Any cut of ribs have several bones that get in the way of easily getting an accurate temperature of the meat to determined how “cooked” it is. But more importantly, there is a great deal of connective tissue that needs to break down even if the meat has reached a minimum temp. So, how does one tell if ribs are done?It is pretty easy. The “bend test” can help determine if your ribs are not only cooked, but done. 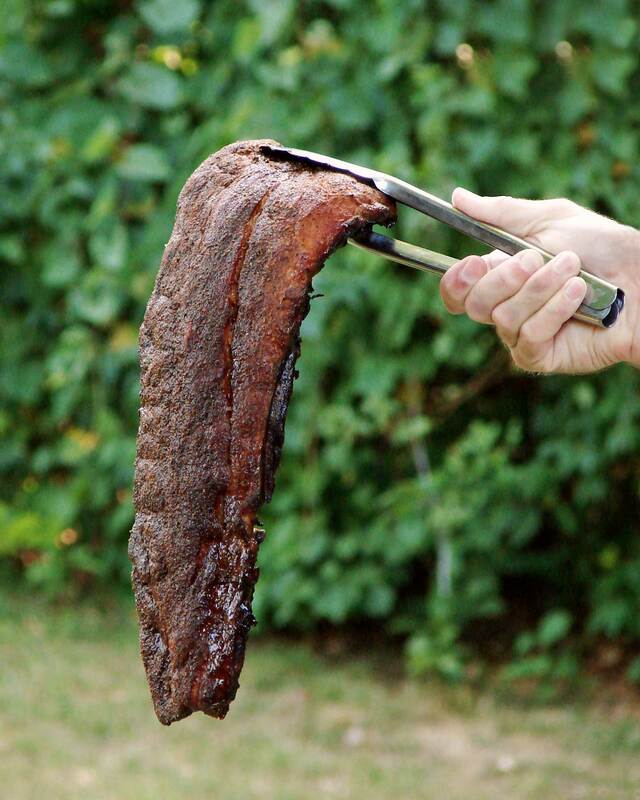 The flexible bend to almost vertical tells you this rack of ribs is nearly fall-off-the-bone done. Using a sturdy pair of tongs and a firm grip, pick up the rack of ribs at the thicker end (this is the blade end, closest to the shoulder of the tasty beast). Keeping the rack over your grill, lift the ribs up horizontally so the entire weight of the rack dangles from the tongs. The rack is done if it easily bends downward to a near-vertical position. The more flexible the rack, the more the connective tissues have broken down, and the more “fall-off-the-bone” tender the rack is. Most company like ribs “fall-off-the-bone” tender, but most BBQ judges like a more firm texture to the meat, requiring the teeth to pull the meat off a bit. Most company like ribs done to the point of “fall-off-the-bone” tenderness (right). However, most BBQ judges want a more firm texture to the meat, requiring the teeth to pull the meat off a bit (left). This entry was posted in BBQ Tips, How-To Guides and tagged baby back, babyback, Bar-B-Que, Barbecue, BBQ, cooked, cooking tips, doneness, grill, how-to, meat, pork, pork ribs, ribs, spare ribs, St. Louis Cut. Bookmark the permalink.